German Blueberry bread is the best breakfast bread ever. 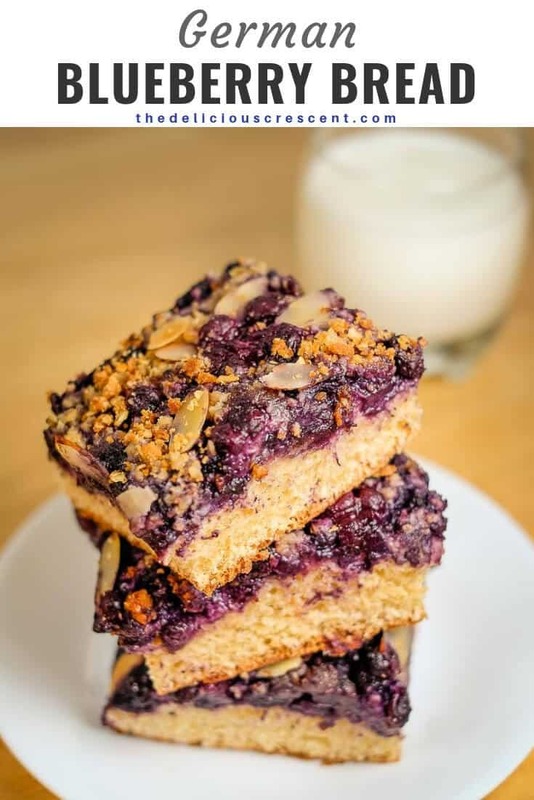 Sweet and juicy blueberries with a streusel topping and toasted almonds on a soft cake like bread. Recipe in two ways – healthier and classic. In Germany this treat is called Blaubeeren Kuchen, which actually translates to Blueberry cake. But it is a yeast based cake-like bread and more akin to the breakfast breads that are popular here in the US. So I decided to call it blueberry bread. If you are looking for a baked blueberry treat that is made from scratch and without using baking powder or baking soda then this is the one for you. 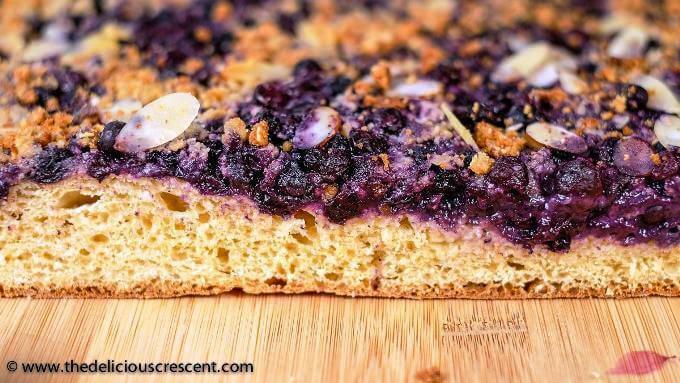 A large soft yeast based rich dough is rolled out and topped with juicy blueberries, streusel, nuts and baked to give you this delicious blueberry bread with streusel topping. The healthier version of this recipe works great for a weekend brunch. The classic version is delicious with evening tea or coffee. The healthier version of this German blueberry bread includes many small changes to the original recipe. The use of dates instead of sugar, olive oil instead of butter, addition of bran, flax seed, oats and whole wheat flour, together make this bread lower in added sugar, saturated fat; and higher in fiber. The star ingredient though are the blueberries and we are using two pounds of those lovely berries, so I will further elaborate on their nutrition potential. Blueberries contain anthocyanin, a flavonoid with powerful antioxidant effect, which gives these berries the characteristic blue color. The myriad health benefits of blueberries have been attributed to this flavonoid. These berries are good for bone health as they contain phosphorous, iron, calcium, manganese, magnesium, zinc, and vitamin K. Blueberries are also great for heart health as they are a good source of fiber, folate, potassium, vitamin C, vitamin B6, and other phytonutrients. Apart from the anthocyanins, vitamins, and minerals, blueberries contain a variety of phenolic compounds – quercetin, myricetin, kaempferol, and chlorogenic acid. Together they contribute to the antioxidant potential of blueberries. And so are beneficial for cancer prevention. Studies have found that blueberries can help reduce the risk of cognitive damage, and improve short-term memory. And these fiber rich berries are great for maintaining regularity, intestinal health and weight management. Make sure to check yeast package instructions for suggested temperature. Use light olive oil for baking this bread as the flavor is not so strong. If using frozen berries, do not thaw them prior to use, to avoid bleeding and discoloration. Blueberry bread freezes very well. It can be packed in freezer safe bags and frozen. You can make half the recipe in a smaller baking sheet. The classic version of this German blueberry bread is also served as a dessert. Note the recipe ingredient list below in the recipe notes section. 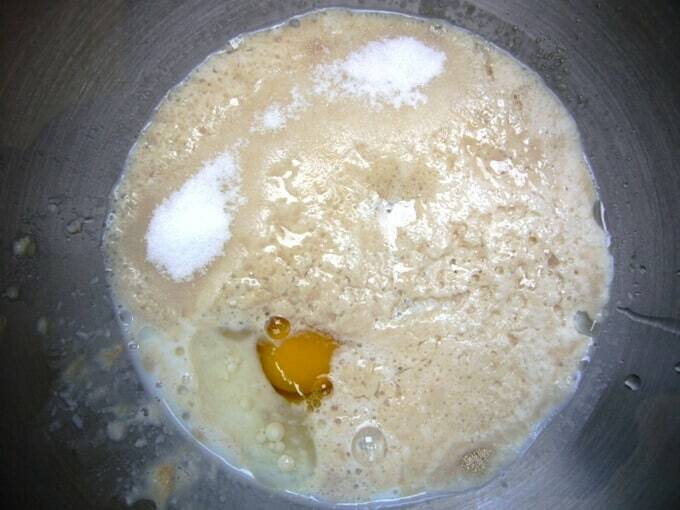 Do let the yeast foam up well before adding other ingredients. Allow the dough to rise in a warm environment and be sure to give sufficient time for the dough to double in bulk in the first rise. If you have trouble with the dough doubling in bulk, then place the dough or the rolled out bread dough in an oven that has not been preheated. Next place a pan of hot water one level below the dough container or baking sheet and this will help the dough rise better. What kind of breakfast breads and recipes do you make with blueberries? 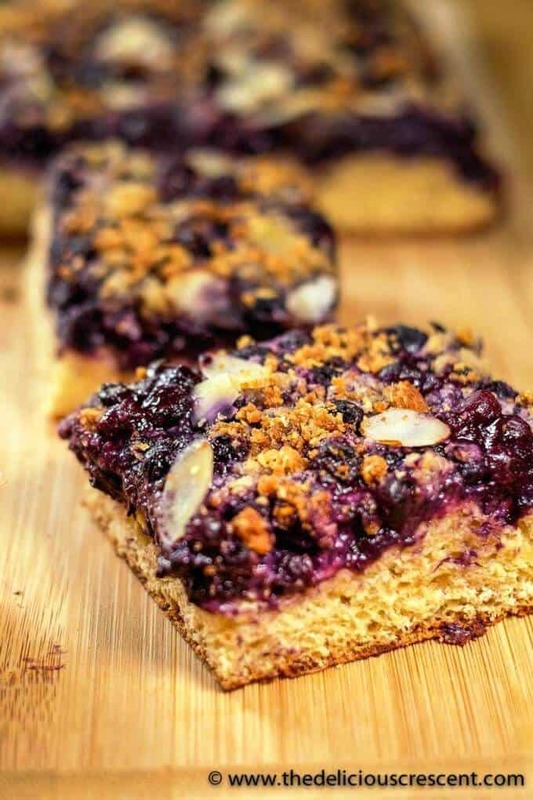 Did you try this “German Blueberry Bread”? German Blueberry bread is the best breakfast bread ever. 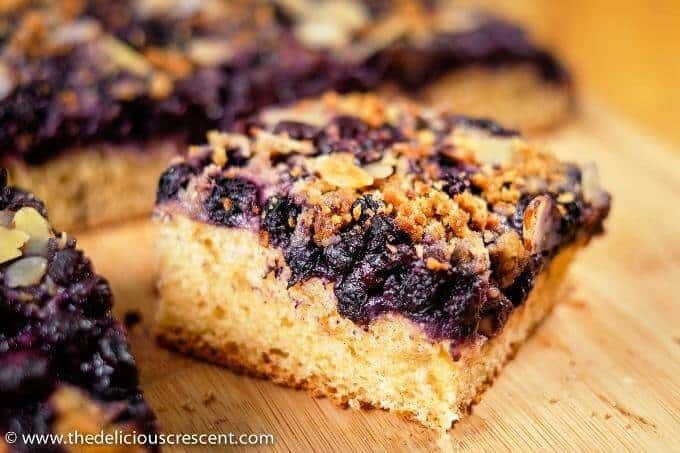 Sweet and juicy blueberries with a streusel topping and toasted almonds on a soft cake like bread. Recipe in two ways - healthier and classic. Healthier version with less sugar, less saturated fat, extra fiber and more goodness. Sprinkle the yeast over warm milk. Then scatter sugar on the top. Let it stand for about 10 to 15 minutes in a warm dark place, making sure that the yeast bubbles/foams up on the surface. Add olive oil or butter (melted and cooled), honey or sugar, 2 eggs, vanilla and then about 3½ cups of the flour, salt and mix lightly. Let stand for a few minutes for the flour to absorb the moisture. If using wheat bran and flaxseed meal, then add and mix into the dough. Next add about half cup of flour to make a soft dough. Knead well. If the dough is slightly sticky its okay. As the moisture will get absorbed later. It is very important to use as little flour as possible and not make the dough very dense. 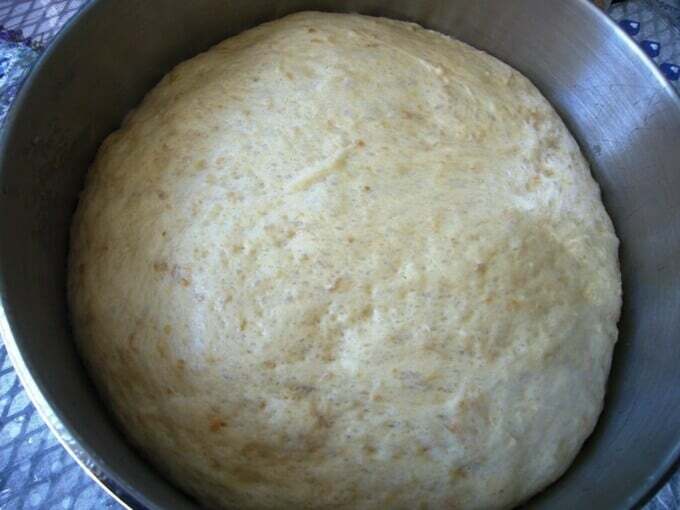 Allow the dough to rise and double in size. This is a rich dough so it may take time. The time may vary from 1 to 2 hours or more. Preheat oven to 425ºF (200ºC). When the yeast dough has doubled in size, punch it down and lightly dust it with flour. Transfer the dough to work surface and knead briefly. 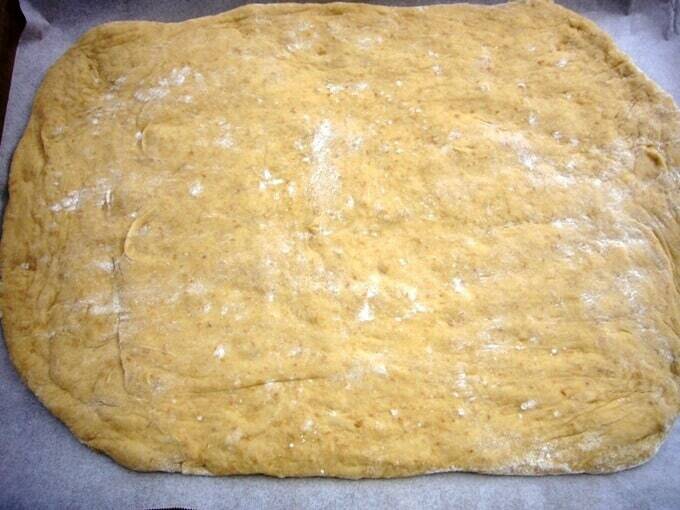 Roll the dough into a 15 x 11 inch rectangle. Using the help of a rolling pin transfer it to a parchment paper lined baking sheet. Let the dough rise once again for about 20 to 30 minutes until it looks a bit puffed up. Lightly brush olive oil or melted butter all over the dough. Take the fresh (rinsed and drained) or frozen (not thawed) blueberries in a large mixing bowl. Sprinkle corn starch over the berries and stir. Evenly spread the blueberries all over the dough. Next scatter the sugar and chopped dates (if using). 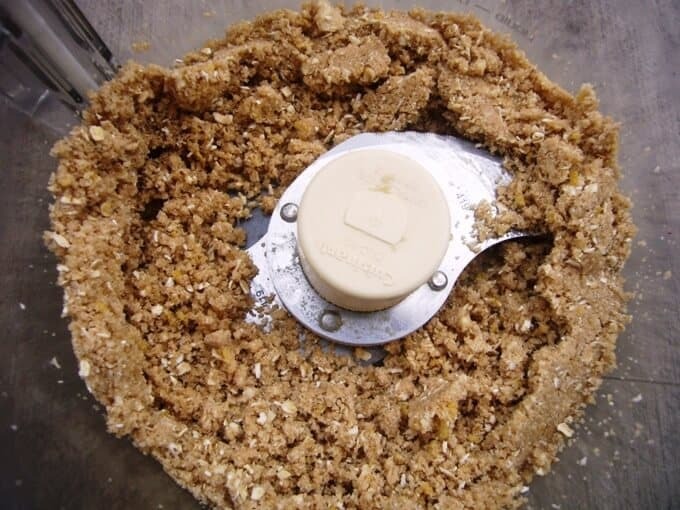 Place the oats (healthier version), flour, sugar, butter and cinnamon in a food processer. Pulse a few times and process until the mixture is like coarse breadcrumbs. 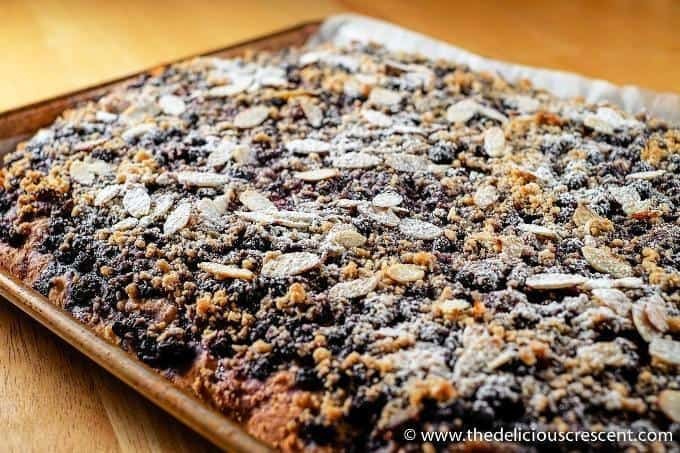 Sprinkle this topping all over the dough followed by the sliced almonds. Bake for 25 minutes until the bread is nicely browned on the edges and blueberry juices are bubbling on the top. Remove from the oven and allow to cool well before cutting the blueberry bread. Oh Man! This looks like the most amazing bread I have seen in a while. 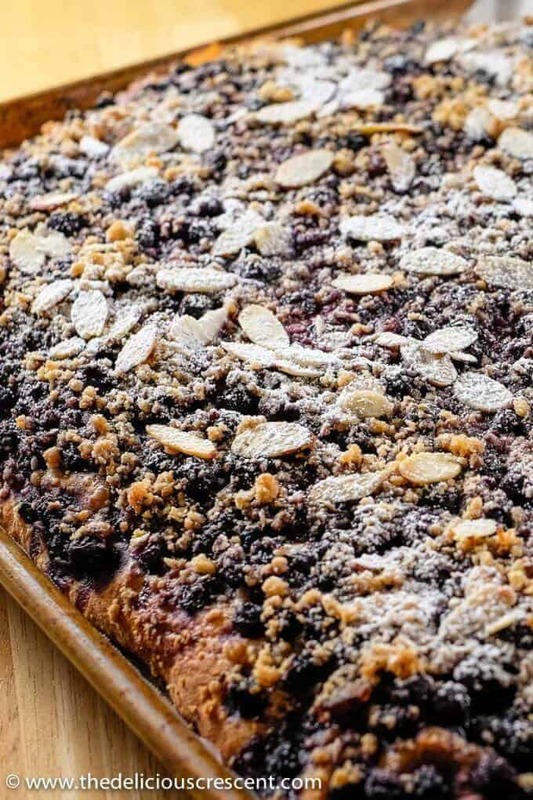 Loving all the juicy blueberries and streusel on the top! Thanks Neha. That is such nice feedback. Appreciate it. Such a tasty looking bread, for a delicious and full of goodness breakfast. Look at all those blueberries, just perfect. This is a first for me. I have never used blueberry with a yeasted bread. Always with pies, tarts and muffins. Since I love blueberries, I will not wait for summer to do this. 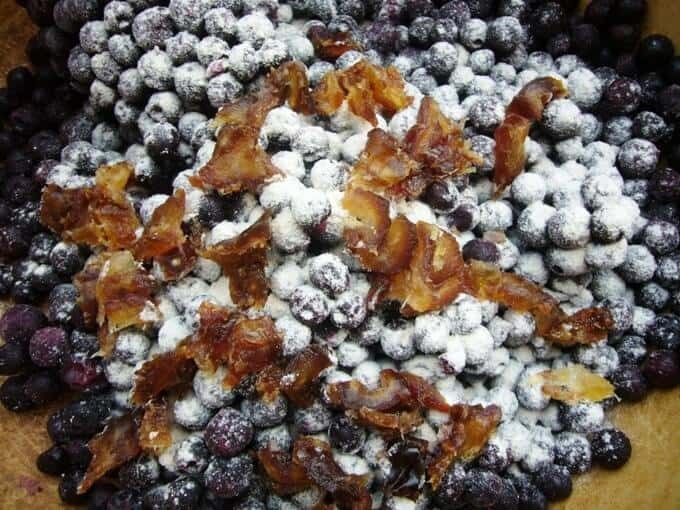 I am going to grab a box of frozen blueberries on my next trip to the supermarket to try this one! :-) Thanks for the recipe! Thanks Neriz for your thoughtful feedback. For the recipe, 2 lbs of blueberries may seem like a lot, but I just pile them all on the flat bread dough and the berries cook down to a thick topping. 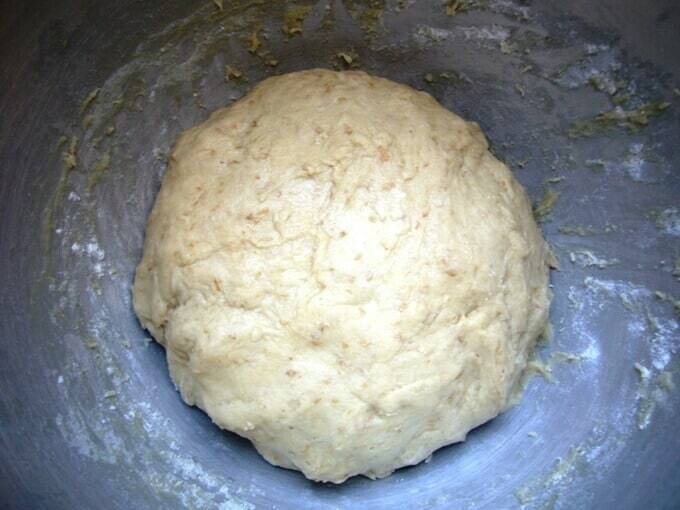 Also the key is to have a working bread dough, meaning it has risen well in both the dough and rolled out stages. I love the sound of this bread! Is it similar to a stollen? 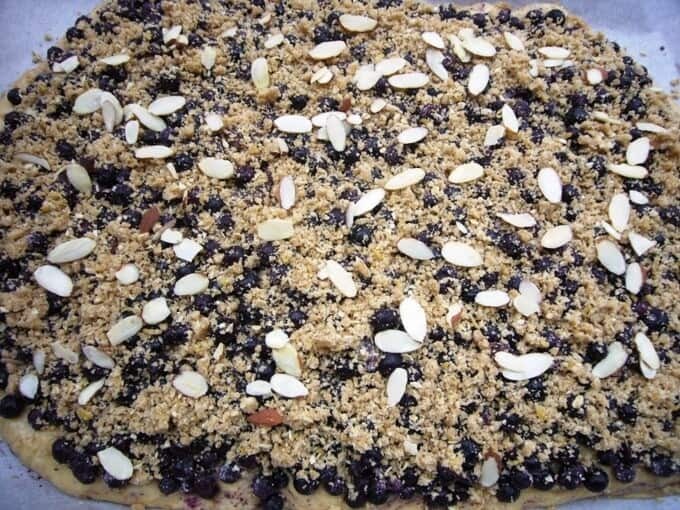 I like that it is a raised bread and with all those delicious blueberries, one of my favorite berries, on top as well as the almonds & streusel, I am so ready to make this. One of my favorite breakfast breads to make with blueberries is a banana blueberry bread and French Toast with blueberries is a close second. Thanks Linda. It is a yeast based cake-like bread – so in that sense the concept is similar to a Stollen. But the dough is not dense like what is typically used for stollen. Its more softer. I like the bread recipes you mentioned. Those flavor combos sound delicious.